What better way to start the year than admiring a sophisticated purse from an established designer bag brand. I celebrated the holidays with my family, and received a fabulous gift from hubby dearest. Yes, it was a bag of course. What else would Señora Cartera want? Forgive me, I digress from my intent which is to sing the praises of this under $1000 bag from Tod's. Women love Tod's with good reason. Their handbags are stylish and expertly crafted. Designs are meant to be functional with the added benefit of longevity, not just in concept but in construction. The Tod's Easy Sacca Grande is a solid handbag investment. The coated canvas exterior (done in a stunning saffron color) and grained leather trim comprise the perfect union of casual style and practical materials. The adjustable leather straps as well as a detachable canvas strap add much-needed versatility. You can use it as an everyday bag, a small shopping tote or opt for carrying it cross-body for a more youthful look. It measures 14 x 12 x 6 so no complaints about a lack of storage space can be made. The open top and snap closure offer easy access to the textile-lined interior that sports additional compartments to store smaller items. 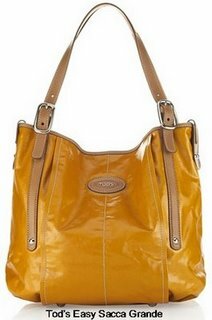 If you did not have an opportunity to add a bag to your collection over the holidays, then the Tod's Easy Sacca Grande is an excellent choice for your first bag of '09.